Ireland skipper has suffered “a little stress fracture” in his foot. Coleman: played 90 minutes against Wales, but missed Poland draw. IRELAND CAPTAIN SEAMUS Coleman is an injury concern ahead of next month’s Uefa Nations League double-header in Dublin. 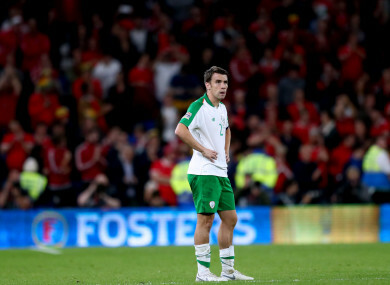 Coleman watched last night’s 1-1 draw in Poland from the stands and afterwards, manager Martin O’Neill told RTÉ Radio that he has suffered “a little stress fracture” in his foot. Ireland host Denmark on 13 October before Wales arrive in Dublin for the second part of the double-header on 16 October. And O’Neill is hopeful that Coleman will be fit to lead out the side in four weeks’ time. Email “Seamus Coleman injury doubt for Nations League double-header against Denmark and Wales”. Feedback on “Seamus Coleman injury doubt for Nations League double-header against Denmark and Wales”.